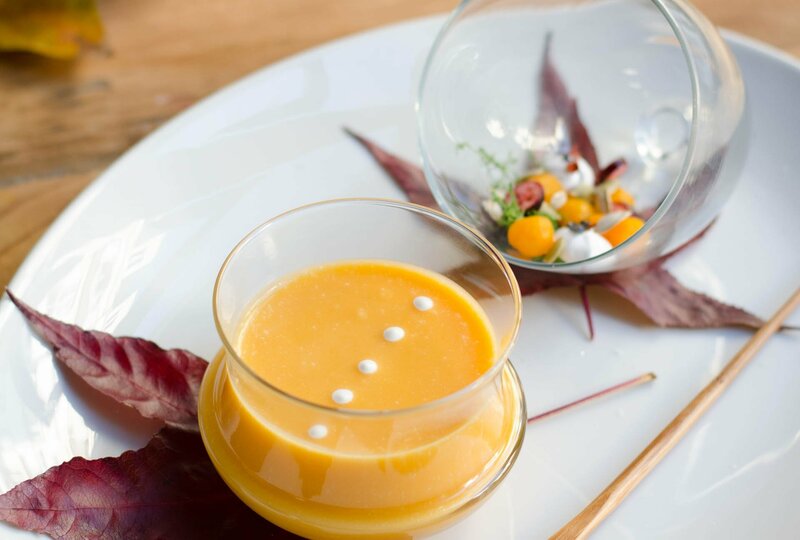 To celebrate Thanksgiving, Le Cordon Bleu Chefs suggest this elegant soup with autumn notes to ease into winter. Use a small melon baller to shape thirty small balls of pumpkin. Keep the trimmings for the soup. Cook the pumpkin balls, covered in a pan with a knob of butter, a pinch of salt and a little water. Set aside the pumpkin balls to garnish the soup. Sweat the onions and leek in butter. Add chicken stock and bring to the boil. Add pumpkin cubes and trimmings, season and cover. Simmer for approximately 40 minutes. Purée with a vegetable mill then strain through a china-cap sieve. Add the milk and cream to the pumpkin soup and bring to the boil. Correct seasoning. Sweat the chestnuts in butter. Crumble chestnut pieces into soup bowls, keeping some for the glass dishes. Pour the hot creamy pumpkin soup into the bowls and decorate with dots of cream. Add pieces of curly chicory salad leaves to the chestnut pieces, in the glass dishes along with the pumpkin balls and mini marshmallows. Decorate the plates with two maple leaves and position the soup bowl and glass dish.